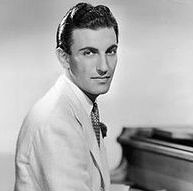 Eddy Duchin (April 1, 1909 – February 9, 1951) was a popular American pianist and bandleader of the 1930s and 1940s, famous for his engaging onstage personality and his elegant piano style. Duchin was born on April 1, 1909 in Cambridge, Massachusetts. He was originally a pharmacist before turning full-time to music and beginning his new career with Leo Reisman’s orchestra at the Central Park Casino in New York, an elegant nightclub where he became hugely popular in his own right and eventually became the Reisman orchestra’s leader by 1932.